In the Derby every year, there is always a horse or two that is simultaneously both a serious contender and a lovable upstart. They have some real accomplishments and wouldn't look out of place in the winner's circle, but their story also has some Disney elements to it. This colt hasn't followed a straight line to this point, but there is enough to like that he is worth a closer look. Can Vekoma win the Kentucky Derby? Last race: The Blue Grass Stakes is in a real slump. The last winner of this race to also win a Triple Crown race was Preakness winner Prairie Bayou way back in 1993. There have been some strong winners since, but none that have won the big races. Vekoma is working against a lot of history, though Good Magic was second in the Derby last year after winning this race. Vekoma was a very nice winner of the race this year. It was the weakest of the three fields in the major preps that weekend, but Vekoma was better than the field. He pressed the early pace, took command through the final turn, and pulled away to win with ease. It was a very professional, classy effort. Prior experience: He made his debut last September at Belmont, winning a maiden race by six furlongs. That was enough to earn him a stakes start, and he made the most of it, winning the Nashua in November at a mile. Both of his first two victories were by exactly 1 and three quarters lengths. Consistency is the mark of a champion, or something like that. He earned a layoff after the Nashua and didn't come back until the Fountain of Youth early in March. He was a little further off the pace than he was used to, and couldn't make up the ground, finishing third. It was more of a rusty effort than a troubling one. Trainer: George Weaver is a veteran guy - he has trained more than 5,000 starters in his career. But he has won only a small handful of graded stakes over the years, has just one Grade 1 win, and this colt is only his second winner of a prep race ever. Weaver is a native of Louisville, so the Derby holds a particularly massive place in his heart. He has made it to the race only once, finishing 17th of 18 in the 2015 Derby with long shot Tencendur. He has been dealt a much better hand this year. Jockey: Javier Castellano took over the ride on this horse for the first time in the Blue Grass, and it makes sense that he would stay in the saddle for the Derby - though he might get pulled to one of Todd Pletcher's horses given the relationship he has with that trainer. Horse and rider had obvious chemistry in this case, and Castellano and Weaver have a long history. The only other horse Weaver has had that won prep races was Saratoga County back in 2004 - he did not make any Triple Crown races despite being strong on the road to the big races. Castellano was on board that horse then. 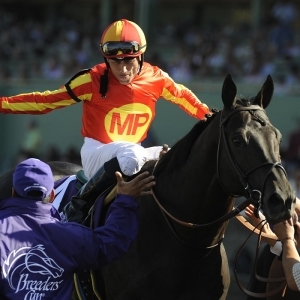 Castellano is a four-time Eclipse Award winner for best jockey and has won eight Breeders' Cup races. He has won only two editions of the Preakness, though, and neither of the other two Triple Crown races. Breeding: Like Game Winner, one of the likely Derby favorites, this colt is a son of Candy Ride. He is a successful sire, and his most notable sons are Shared Belief and Horse of the Year Gun Runner. Vekoma is out of Mona de Momma, a multiple stakes-winning sprinter. In a good omen, her signature victory came on the Derby undercard in 2009 when she beat reigning Champion sprinter Informed Decision. Vekoma was sired by Speightstown, the champion sprinter of 2004. He has been a reasonably successful sire, with the most relevant offspring for this purpose being 2009 Travers winner Golden Ticket. The breeding overall for this colt isn't as strong for the Triple Crown challenge as others in the race, but it isn't a total disaster by any means. Odds: Vekoma went off at 15/1 in the final Kentucky Derby futures pool, which puts him eighth in the field. That feels fair. At BetOnline he sits at +1600 in early action. Can Vekoma Win the 2019 Kentucky Derby? : Yes. He will have to have his best day, though, because other top horses run a similar style, and chasing the early pace in this race can be tough because things can get suicidal for the first half mile. There are others who are better bred, and better at what they do than this one, but this horse certainly can't be tossed. Doc's Sports wants you to try out our expert horse racing handicappers free of charge and is offering new clients $60 worth of free picks that can be used for any Triple Crown race. Get $60 worth of premium members' picks free .